North Myrtle Beach, South Carolina - Jim Nantz is fond of calling the PGA Masters �a traditional unlike any other� and one would like to think he�d have the same sentiment if he had the chance to witness 22 years of the United States ProMiniGolf Association�s (USPMGA) Master�s tournament. This year�s tournament was held on October 12 & 13, 2018, after a one-day delay due to Hurricane Michael. As always, the field was deep with competition from not only around the United States but the world as four countries were represented by the 68 players who competed in the open division, including many past Master�s winners and winners of other US and worldwide tournaments. Despite debris being blown everywhere by the winds, the courses were in immaculate shape and competitors were up to the challenge of the Aloha course, a slightly more forgiving ace course, and the Hawaiian Rumble course, the tournament�s gemstone course, both of which sport their own �Amen Corners� in the back nine. With the delay by a day, a jury of competitors, in conjunction with the USPMGA, determined to cut one round from the scheduled 5 to be held on the Aloha course and to reschedule the remaining 11 rounds with players playing 4 on each of the courses on Friday and finishing with 3 on Rumble on Saturday (versus the traditional 5-5-2 format). This meant that instead of tackling one round a day during the tournament, players now had to adjust their play for the two different courses all within a span of 10 hours. By the time the tournament days rolled around the weather was beautiful and couldn�t be better for putting, sitting around the mid 70s (F) and with barely a cloud in the sky. From the first rounds it started to look like it was going to be the year of Greg Newport, who was scheduled to be the year�s only inductee to the USPMGA Hall of Fame on Saturday night. Newport, the Team USA WAGM captain and 2009 Master�s winner, started the day on the Rumble course, shooting a 32-31-33-28 for the morning rounds, with the 28 being the low score to be posted at Rumble for the tournament. While it�s tough to determine a flat leader after the first rounds with the field split between the two courses, it was safe to say everyone knew those scores would hold up well on the Rumble course. He would back that up with a 27-30-29-31 series of scores on the Aloha course in the afternoon, giving him a 3 shot lead after the 8 rounds. Tied for second behind him were the eventual podium winners Gary Hester and Ricard Lockner who both sat at 244 after the 8 rounds and behind them was a gaggle of competitors just a few strokes off striking the top 3. On Saturday the competitors below the top 30 started their 3 rounds just as the sun rose at 7am and finished around mid-morning for the top 30 to tee off. With a plethora of cameras, both media and personal, out and ready to capture the day, the top 30 teed off for two rounds before repairing for the final round. Throughout the morning, Newport, Hester and Lockner stayed close together, entering the final round as the top 3, despite a slight misstep by Lockner in the 10th round, finishing only at an even par 36. In the end though, the day belonged to Newport who carded a 34 in the final round including an ace on the final hole with the gallery on top of him, to seal his second Master�s championship with a 338 overall score. For his efforts he was awarded a green jacket, the crystal trophy and $5,000 (~4,300 EUR). At the dinner celebration later that evening, the day of Newport continued as he spoke gracefully of his Team USA teammates and supporters, and thanking his family and all who have helped him along the way. He even celebrated �Stanley Cup� style, filling the crystal chalice trophy with beer and having celebratory drinks with past Master�s winners and friends. In the other divisions, Olivia Prokopova carded a 349 to take the women�s division, Greg Ward�s 346 was enough for the capture the senior�s division by one stroke, John Ventura shot a 350 to win the super senior�s division by one stroke and Vanette Block took first in the Amateur division. 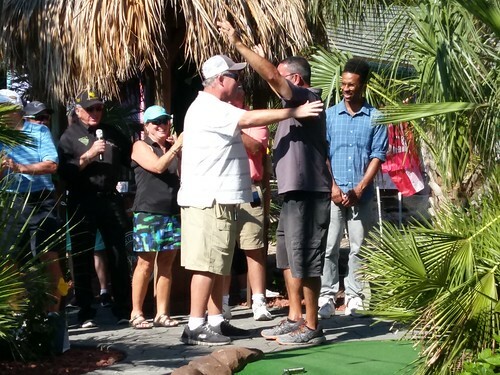 Despite Newport�s success in the open division, his team just lost the top spot in that division by two strokes, losing to the team of Gary Ward and Gary English. The next major USPMGA event will be the US Open to be held at Mr. Putty�s Fun Park in Tega Cay, South Carolina in May 2019. The USPMGA is the United States affiliate of the WMF. The World Minigolf Sport Federation (WMF) is the umbrella organization of 63 Minigolf sports associations worldwide with Continental Associations in Africa, America, Asia, Europe and Oceania. Over 1,000 championships courses are approved for official competitions and over 1,500 international minigolf tournaments are held each year. 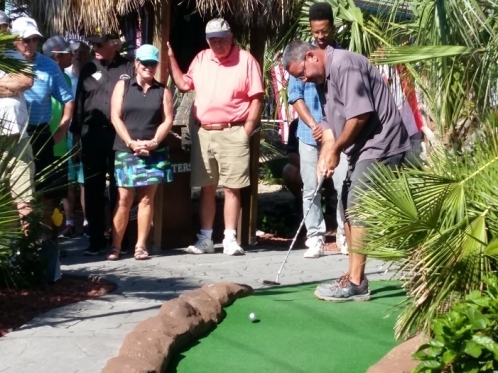 Millions of players all around the world like to play minigolf as a private leisure activity and in public competitions.